Graphic communication in design and construction is nothing new. It has long included the traditional 2D and 3D drawings found on every jobsite. In an increasingly competitive economy, constructors have even begun to regularly use new tools such as animated slide shows, illustrated word documents, and simple sequence animations to differentiate themselves from the crowd. In fact, the videos and tutorials included with our books are now used by architecture and construction schools all over the world to illustrate classroom handouts, lectures, websites, and student projects. At the same time, many professional developers and contractors use these learning aids to support their ideas and illustrate their own construction methods and practices. It’s no secret then that in order to survive we all look for every available tool to quickly communicate complex ideas with our clients, manage risks, plan and document our projects, and clearly explain project methods to a broad community of interests. 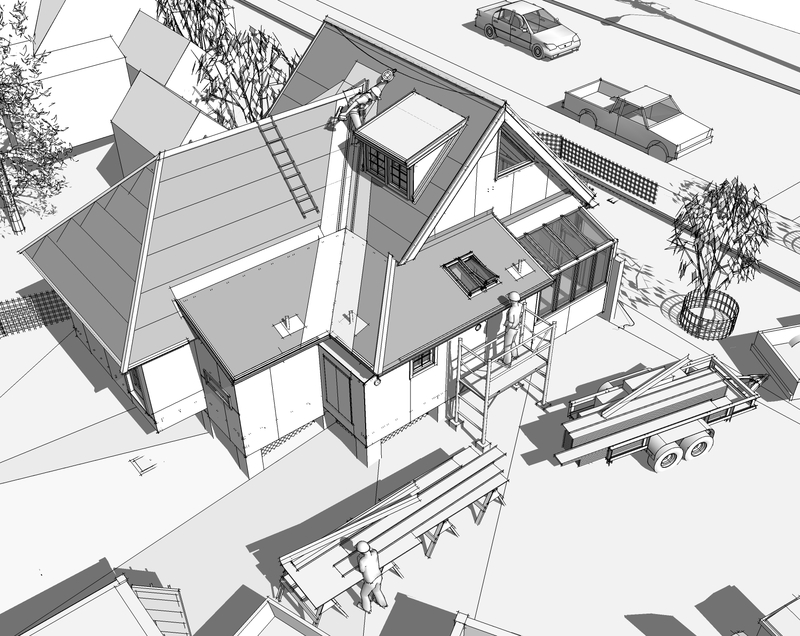 This might explain some of the interest in the building information models (BIM) that are just beginning to reach the mainstream of the construction industry. There’s little doubt that this new environment of graphically competitive practices makes 3D construction models even more important for the future. Construction models are piece-based because they are organized so that every part of the model can be easily identified, modified, and reused in another model as a distinct three-dimensional object. These objects are then counted, measured, and categorized so that their data can be used to graphically manage estimates, schedules, and other related projects. Each of our books includes all of the piece-based construction models used to illustrate that book. This means that each book is a three-dimensional library of not only the parts and pieces of the constructions, but also a collection of the furnishings, tools, equipment, and workers used in the virtual model. Readers are therefore free to deconstruct, reconstruct, and visually explore their own ideas whether in a classroom or the real-world. The notion of shared three-dimensional resources in a virtual model is one of the underlying goals of our books.